The city of Nanjing is the capital and the political, economic, and cultural center of Jiangsu Province. It is one of the ancient capitals and an outstanding tourist city. Nanjing was made the capital of ten feudal dynasties in China. Its tourist areas include the Purple Hill Scenic Area, the Qinhuai Scenic Belt, the Shicheng (Rock City) Scenic Area, scenic spots in the city proper, the scenic belt along the Changjiang River, the Yuhua (Raining Flower) Terrace Scenic Area, and the Qixia Hill Scenic Area. shaped mausoleum stretches for 80,000 square meters. 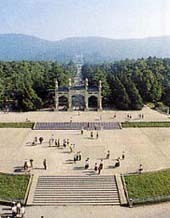 There are 392 stone steps leading up to the Memorial Hall. Built in 1 376 at the southern foot of Purple Hill, Xiaoling (the Mausoleum of Zhu Yuanzhang the founding emperor of the Ming Dynasty), is one of the largest imperial tombs extant in China. The existing structures include the Horse- Dismounting Archway, the Great Golden Gate, Square City, and stone statues of animals and figures. First called Treasure Gate, Zhonghua Gate in the due south of Nanjing is also called Urn City because it resembles a pottery urn. Built in the Ming Dynasty, it is the largest ancient castle in the world and the symbol of Nanjing,tops the list of ancient city gates in China, and represents the timehonored civilization of the Chinese nation. known scenic area in the city of Nanjing, featuring an enchanting scenery and many historical sites. The visitor can make a tour of the area by boat or on foot. The major scenic spots are Taoye Ferry, Confucian Temple, the East and West Markets, the former residence of Li Xiangjun the White Egret Isle Park, Zhayuan Garden, and the castle of Zhonghua Gate. Lying in the northeast of Nanjing, Xuanwu Lake is 1 5 kilometers in girth and has a water surface of 444 hectares. The five isles in the lake Liangzhou, Circular, Water Chestnut, Green Jade, and Cherry Blossom isles are connected by causeways and bridges to form a charming scenery. 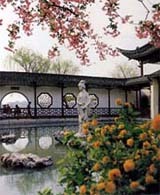 Lake Pavilion, and Lotus Blossom Admiration Pavilion.